Our very Full House: Can you spot the socks? Can you spot the socks? This time, the funnies come to you in pictures. I covered Ethan up, and then moved on to Cameron. And this is what I saw at his foot end. Cameron is notorious for taking his socks off. 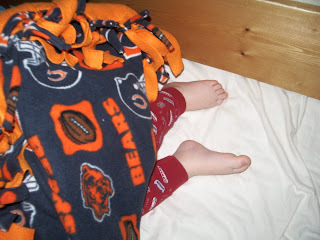 And, he had apparently done it again.....so I was looking around his bed for his socks, but I couldn't find them anywhere. I'm looking, looking......"Where in the world could he have put them?" I thought to myself. I don't know why, but something caused me to look up on Colin's bed. Notice anything on Colin's hands? I just about died laughing. I called for Shane, then proceeded to run for the camera. I don't know why Cameron's socks ended up on Colin's hands, but it was the funniest thing to both of us. We laughed for several minutes and I snapped a few pictures. 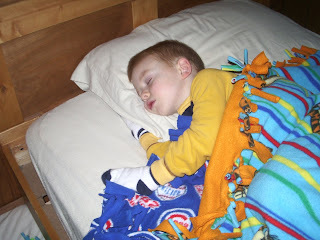 Since Colin seemed to be so cozy, I decided to cover them both up and leave the socks right where they were! ok now that is hilarious!!! who needs television when you can just watch colin and cameron's day! Reminds me of when me and shanna shared a room. we wouldn't go to bed for hours at a time and had all sorts of games up our sleeves!!! too funny! love those boys! i love that! so precious! That is so funny. They do look cozy. How are you guys doing? Up to anything new? Looking forward to hearing what their explanation is for this one...too cute! 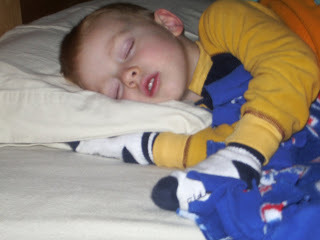 There is nothing in the world like sleeping children. 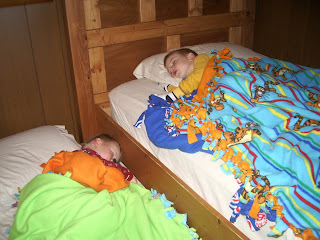 Jen and I go into our boys room every night before we head for bed to check on them and see them sleeping. Once in a while, you get treated with something really comical in the process. I can see that this is only going to get better with age. Really funny! Your boys are adorable, and I love the sock thing. My 2 year old will take off my (almost) 1 year old's socks and wear them on her hands (she calls them minutes). 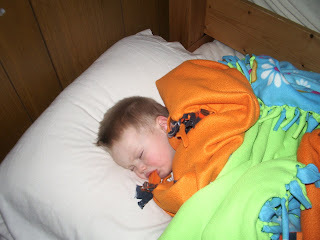 I read back a few posts and wanted to say "Thanks" for sharing the YouTube video of Logan - that was awesome, I had tears streaming down my cheeks as I listened to that little boy state the truth in probably the most plain language I've ever heard. It was really touching. I also read about your miscarriage, and just wanted to say I'm praying for you to be comforted, and that God will continue to work His will in your life. You have a beautiful family, and God's timing is perfect. He doesn't make mistakes. Anyway, I just wanted to encourage you to continue being a great mom to your boys - it sounds like you are doing a good job raising Godly little men! Those boys are so funny! How far apart are they in age? Our two will be sharing a room soon and I can see it coming in my future! Those pictures are priceless! Aren't little boys the funniest little things? Yours are so cute! I somehow ended up over on your blog and read the story about the socks. THAT is so funny! I'm glad you took pictures of that. I bet it will always make you laugh. If you are ever in a bad mood, break out the socks on the hands picture! So funny.